Spring clean your cleansing routine with Caudalie & a get a full size free gift! Caudalie is one of those brands that impresses me more with each product I try. They focus on keeping the ingredient list as natural as possible - they don't use parabens, mineral oil or animal-derived ingredients and my dry, sensitive/reactive skin loves the products. They currently have a campaign around their line of cleansers and it really got me thinking because the premise is that your skin doesn't have the same needs every day so why use the same cleanser every day? They have also taken a new approach to the double cleanse, which I want to share with you today! 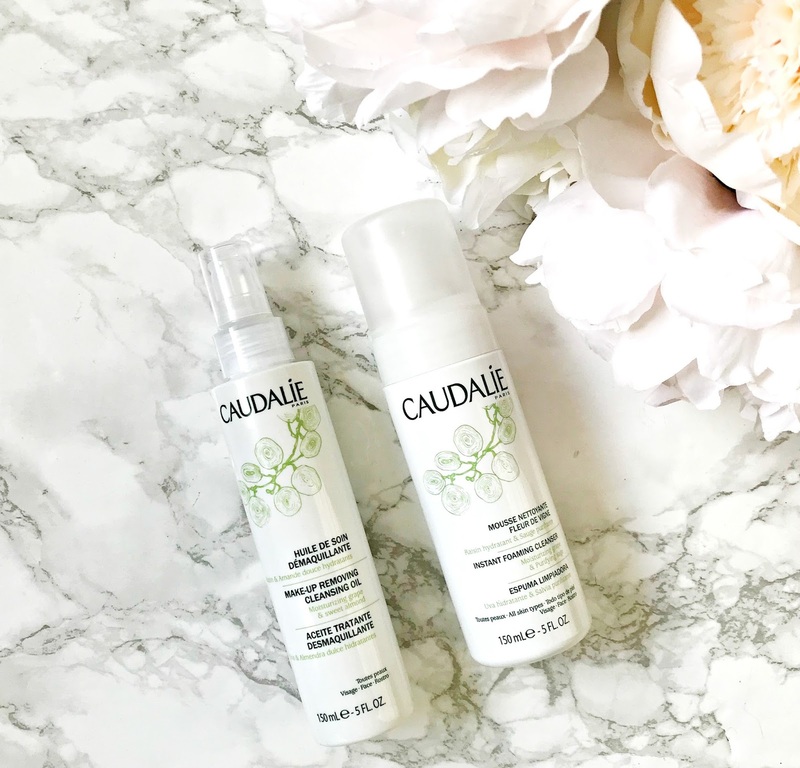 I generally have a number of cleansers on the go but I know that not everyone is a skincare junkie with a 'cleanser collection' so what Caudalie are suggesting is that you have two cleansing products in your cupboard and that you maximise their potential by using them in a number of ways. I was kindly sent the Instant Foaming Cleanser and Makeup Removing Cleansing Oil as these were deemed the most suitable for my skin type. If you go on to their site, you will find suggestions for each skin type. Obviously, these products can be used individually but it was suggested to me to use one pump of each, combined and applied to damp skin. The oil breaks down makeup/spf and the foam cleanses the skin - this type of double cleanse is ideal for people who are busy but really want to take care of their skin - let's face it, wipes will never cut it but this way you are double cleansing with one step. I find that the oil is really effective at breaking down liquid liner and mascara, without stinging my eyes - something that not all cleansing oils can do! I must admit that I was wary of using the foam as generally foams and dry skin = Sahara like conditions, but this one is sls/soap free so it doesn't have that stripping effect usually associated with foam cleansers. Overall, the result of using both products is comfortable, clean skin. I will be posting an updated skincare routine soon, which will feature both of these products, which I alternate with a cleansing balm. I look at my skin every morning and evening before I use any products to see what it needs - is it looking inflamed? Is it flakey? Is it feeling tight? Is it congested? These are the questions I ask daily before I apply any products and it's something that I suggest you do too - if not daily, then at least look at your skin's needs seasonally as the weather and environmental factors will change its needs too. Then why not take a look at the cleanser combinations on the Caudalie site and decide which duo would be best for you? Also, between now and April 26th, if you spend £50 or more on the Caudalie site (can be on any products, not just cleansers), you will receive a full-sized Gentle Buffing Cream by using the code SPRING18 at the checkout! I'd love to hear your thoughts on this cleansing routine and if you ever combine cleansers? What's your favourite type of cleanser? All products are bought by me, unless otherwise stated. Both of these cleansers were kindly sent to me. Opinion is always my own.